This award is given annually to an individual or group that has demonstrated exceptional skill and knowledge in practicing sound management of rangelands in the State of Colorado. ​Membership in the Society is not required. The recipient will be requested to attend the Section Annual Winter Meeting to receive the award. Public announcement of the award will not be made until presentation at the Annual Winter Meeting. ​scroll to the bottom of the page for criteria and submission information. Gregg Stults (right center) and MaryAnn Stults (right) of Stults Family Farm (center) was presented with the award at the annual fall meeting by President Dan Nosal (left), and award nominator Julie Elliott (left center). 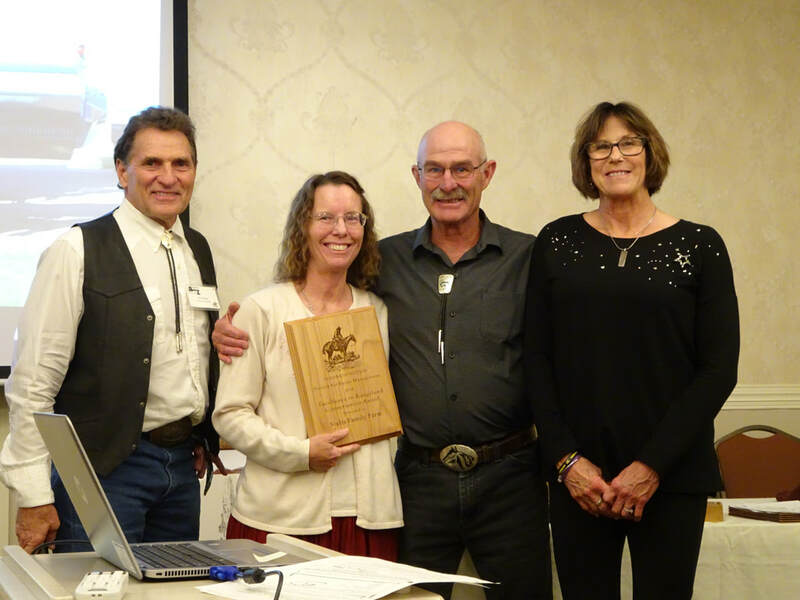 Stults Family Farm was nominated by the Colorado Section SRM for the Excellence in Rangeland Conservation award for consistently demonstrating exemplary efforts in the stewardship of the rangeland resources under their management.